Highly diluted acetic acid, or vinegar, has been shown to be an effective agent to treat and prevent infection in burn wounds. Burns are a common traumatic injury and with a high risk of subsequent infection due to loss of the normal skin barrier. This can lead to sepsis (blood poisoning), which is the leading cause of death in patients with burn wounds. Infection in burns is hard to treat with traditional antibiotics, however, as they do not effectively reach the wound and the infecting organisms are often highly antibiotic resistant. But now two studies by the Birmingham team, one published in Burns and the other in PLOS ONE, have demonstrated that low concentrations of acetic acid can be used as alternatives to topical (surface applied) antimicrobials and traditional antimicrobial dressings to treat and prevent bacterial colonisation of burns. The current use of acetic acid in clinical settings has been limited due to concerns of patient tolerability but this proof that it is effective at far lower concentrations than previously thought now offers hope for the development of novel treatments. The acid was tested against 29 common wound-infecting pathogens, including Pseudomonas aeruginosa and Acinetobacter baumannii, grown in the laboratory. The ability of highly diluted acetic acid to inhibit growth of pathogens, prevent the formation of biofilms, and then eradicate pre-formed biofilms was tested, with low concentrations (0.16-0.3%) shown to inhibit growth of all strains, prevent them from forming biofilms (bacteria attached to a surface) and also to eradicate mature biofilms after three hours of exposure. 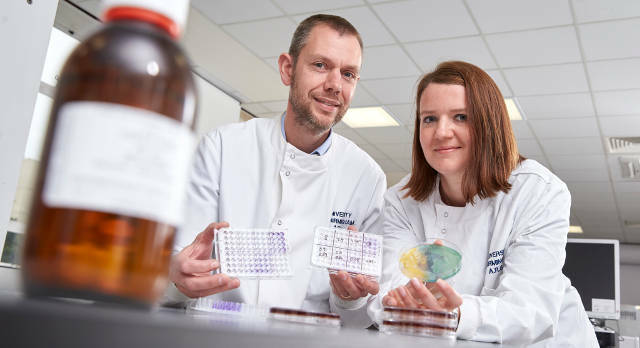 The team are now planning clinical trials in which they will test the effectiveness of two specific concentrations of acetic acid on patients at the Healing Foundation Centre for Burns Research at QEHB. A further study will also test the effectiveness of plain dressings soaked with acetic acid, against the more commonly used, but more expensive, silver-based dressings. Dr Mark Webber, from the University of Birmingham, added: “Acetic acid, or more commonly, vinegar, has been used sporadically in medicine for the past 6,000 years – being successfully implemented to treat plague, ear, chest, and urinary tract infections. “In that sense it’s a well-known antimicrobial which has seen sporadic clinical application. Our work now gives a firm evidence base to guide the development of treatments which promise to be cheap and effective. “These new trials will hopefully provide clarity on how this can be implemented for burns patients across the world. He stressed, though, that people should not start applying vinegar from their food cupboards onto burns and wounds at home but should seek proper medical advice as usual. The acetic acid used in the lab tests is highly diluted and in its pure form.